ahh, 3Blue1Brown - i've watched some of his "easier" videos - introducing complex numbers and various pi-related concepts - i really like his delivery style, thanks for those - i'm probably a bit better prepared now to start watching those ! 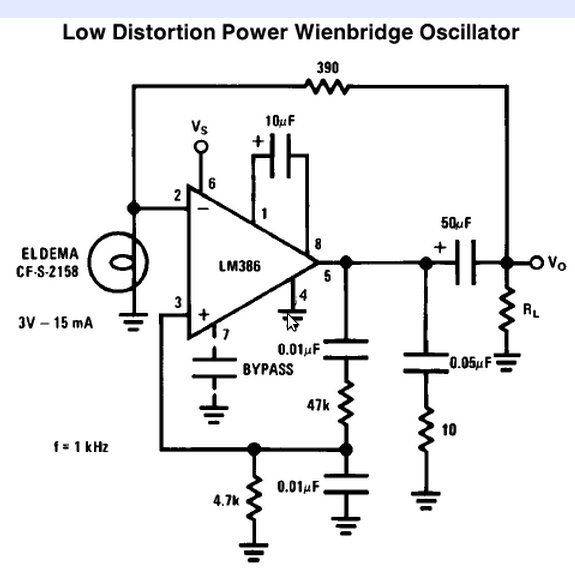 that YouTube guy also had a tutorial on making a simple amp with the LM386 chip; thanks for those ref. nos. - will check them out and study the datasheet and try to learn what the LM324 lacks. wow - that looks good, thanks ! the attempted replication of the original (Quadrature Oscillator) circuit as per my schematic in reply #2.
have been trying to make sense of the datasheets and it seems the LM324 is really quite "weak" with no mention of Watt-age anywhere, or Power Output - closest i could find is 40mA "Output Current". whereas the LM386N-1 at Vs=6V and RL = 8 Ohm puts out a 'typical' 325mW. just a mention of "connect via earphones"
Even so these present an inductive load and might stop your oscillator from working because of this. See enclosed for a 'quick an dirty' loudspeaker driver. Well it has a lowish input impedance, that might affect the oscillator. True. It'll take < +/- 10mA peak - most opamps should handle that. Could increase the resistor value . Worth a try if you've got a few common components knocking about? Obviously you'd need a 5v supply capable of > 1/2 amp or so to drive it. I got it to work, but even with a good new protoboard, I ended up mounting the major components close to the board with trimmed leads. For Rs I used a 10K fixed resistor. Use 5V from USB to UNO. My meter measured about 1.44kHz, and using the 1uF output cap into an el-cheapo flat 16R speaker, it was not loud, but the speaker could be heard. Just used as 5V on A0. It looks like most of the readings are in the right ball park. i knew keeping that old phone would come in handy ! i also measured the speaker in the handset itself and it registered about 100 Ohm on the multimeter. both speakers functioned (finally!!) when i connected it to the 555-square wave generator, adding a 0.1 uF cap in series between 555-output pin and the speaker. still fails on the 'Quadrature Oscillator' circuit - even tried switching the cap from 1 uF to 0.1 uF. thanks - will get the components and give that a go. the Arduino pin is just to be able to control "on/off", "high/low" "sound/silence", right ? the current power supply i'm using gives out 500mA. great that it worked for you ! i see you added an extra (1 uF?) cap on the power rail for decoupling. i suppose i should also trim my leads, they're really extra long on the caps. that looks good - will definitely give that a go ! The sort of headphones I was thinking of had an input impedance of 1K. When you tried the 100R and it did not work, did you look at the oscillator on the scope thingie? Was it still oscillating? i see - even higher, huh ? what spec should i be looking at (comparing the 555 with the LM324) when one can produce sound, and the other cannot - are we talking about power output here ? anyway, i checked it again - without the speaker, and then migrated to the PCscope program - *again* thanks a big bunch, TomGeorge - it really saves the extra step in having to plot it in the spreadsheet !! it was all still, until i "jiggled the pot" - quite the finicky circuit as you hinted at earlier. here are those 3 different plots at various pot-positions - maybe some of you experts recognize what is going on there. i'm assuming that there is no need to change the circuit anymore - i was thinking of trying to replicate the positions exactly as TomGeorge built his - but since we can confirm the waveforms are coming through confirming oscillation, it means the circuit is working - just not providing an output recognizable by any speaker i have at the moment. would trimming leads and rebuilding the circuit more compactly, squeeze more juice out of it ? it means the circuit is working - just not providing an output recognizable by any speaker i have at the moment. Yes the "at the moment" seems to be the problem. There is no reason why you should not hear something if the speaker is not loading the oscillator AND it is connected correctly. Get yourself an ACTIVE speaker, that is one that needs a power supply. I would check your speaker wiring again while all the time monitoring the signal using the Arduinoscilloscope. You can even try moving the input of the Arduinoscilloscope to measure across the speaker to measure what the speaker is seeing, swap over the speaker and capacitor so one end of the speaker goes to ground. If you still get a healthy voltage across it and you can't here it either the speaker is broken or your ears are. Did you try replacing the pot with a 10K resistor? I think the protoboard may be the problem, I had trouble until I shortened the leads, so its more a mechanical connection symptom than a layout problem. PS. That simple Oscilloscope is good isn't it.